The 550th episode of Armin van Buuren’s radio show is being celebrated with a big world tour, covering six shows in five countries during the month of March. Now that the first three events have taken place, the worldwide impact of A State of Trance 550 has been revealed by Armada. In addition to the weekly amount of 20 million listeners, broadcasted on 60 stations (satellite & FM) in 48 countries these special live broadcasts of the shows produced ten-thousands of views via YouTube, tweets via Twitter and views via www.astateoftrance.com. According to Armada, during each event, an average of three tweets a second using ‘hashtag’ #ASOT550 are being sent, resulting in more than 90,000 tweets per event. 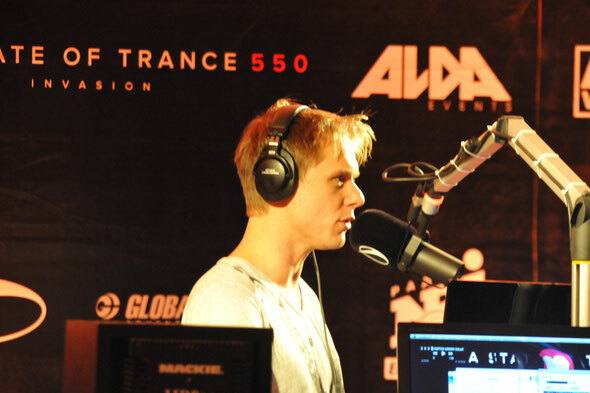 During the first ASOT550 show in London, the label said that #ASOT550 became a worldwide trending topic on Twitter for six hours, and was the most used term on Twitter. On top of that, nearly all DJs that played during the show, also became trending topics on Twitter. After the shows in London, Moscow and Kiev, the amount of page views hit nearly one million for www.astateoftrance.com. The amount of YouTube views of Armada Music, the label behind Armin’s releases, rose by 3.5 million views within one week, reaching nearly 600 million total views. With another three events to go, in Los Angeles, Miami and Den Bosch, the amount of tweets, views and hits will continue to grow. Each show will be broadcast live via www.astateoftrance.com. For the final edition, March 31st in Den Bosch, The Netherlands, there are still tickets on sale via the website - www.astateoftrance.com/tickets. The edition in the Brabanthallen, Den Bosch is the biggest indoor trance-event in the world, with 40 DJs all to be seen live via the website.